Rublev Colours Ultramarine Blue (Red Shade) is an intense deep rednish-shade blue color from inorganic pigment of sodium aluminum silicate composition. It is a transparent, fine grained color with high tinting strength. This ultramarine blue is ground in walnut and linseed oils without additives to change the effect of the pigment and oil mixture. As a result, the paint is producing slightly stringy brushmarks due to the hydrophilic nature of ultramarine. Although ultramarine oil paint is not unique, this is a novel variation of this popular color. Ultramarine pigments are sodium aluminum silicates of the composition Na8Al6Si6O24.Sx(Na-rich) or Na, _yAl6_ySi6+yO.Sx (Si-rich). Small sulfur containing anions (e.g., S3 and/or S2) are bound as chromospheres in the interstices of the crystal lattice to equalize the charge. Depending on composition, blue, red, green or violet pigments can be obtained, the hue being altered by varying the amount of silica. Ultramarine pigments have a high heat resistance but their universal use in paint is limited on account of their poor hiding power and limited weather resistance. Special types of ultramarine pigments are coated with silica to reduce ultramarine's susceptibility to acid and improve its weather resistance. Note: The scan of the "drawdown" (left) contains a pre-mixed paint film of 6 mil (0.006 inch) thickness applied to a standard test card for the purposes of examining color consistency, opacity and other qualities. The drawdowns show the color full strength (mass tone), on the left, and mixed in a 1:2 ratio with titanium white on the right. The bottom area of the drawdowns are scraped to show undertones. All pictures of color swatches in this web site are only approximations of the actual color of the oil paint. We taken every care to match the color in these pictures on calibrated color monitors to the actual color. However, because of the wide variance in color monitors the results you get may vary. 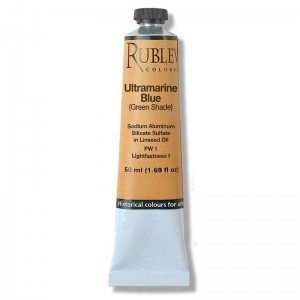 Note: Some separation of pigment and oil may occur in Rublev Colours Artists Oils and is a natural process when no stabilizers are added to paint to prevent this from occurring.